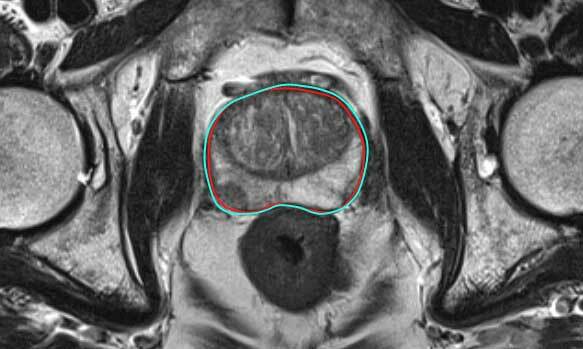 Magnetic Resonance provides exquisite and detailed imaging of the pelvis using magnetism and radio waves rather than X-rays. Dedicated small field of view sequences are run to assist in obtaining high quality resolution images of the prostate and surrounding anatomical structures. No specific preparation is required for this examination. Patients with pace makers, aneurysm clips or ferromagnetic metallic objects must advise the MRI staff when making your booking. You will be required to lie on the MRI bed on your back. A brace-like support will be secured over your abdomen and pelvic area. The table will then move into a wide-bore tubular gantry, which is open at both ends. During the examination you will be in constant voice contact with the Radiographer. The radiographer may ask you to hold your breath for certain sequences. You will be given headsets to facilitate the verbal instructions by the radiographer. If sedation is used your pulse and oxygen saturation levels will be monitored with a pulse oximeter. This is a small clip attached to your finger. During the examination, a relatively loud knocking noise may be heard, but this is normal. You may experience vibrations during part of the studies. The examination is entirely painless and usually lasts between 30 and 45 minutes.